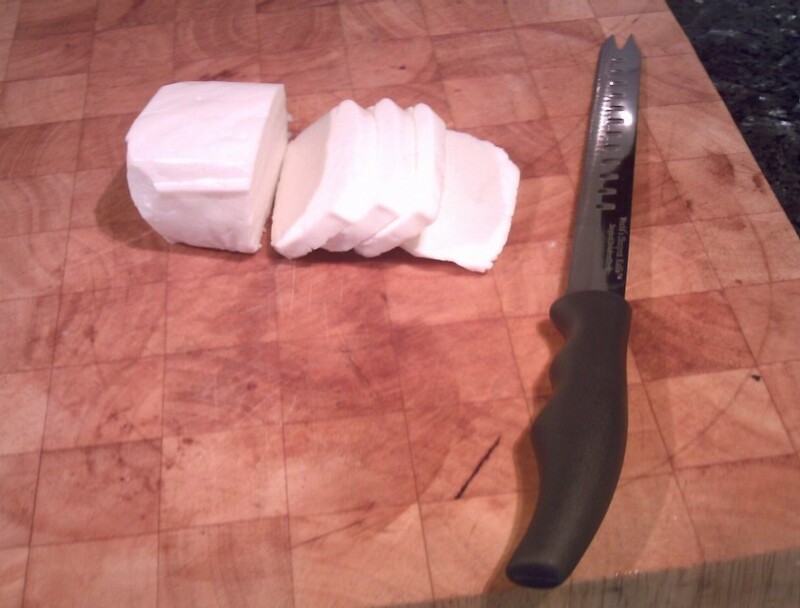 Ingredients for cooking Halloumi Halloumi is a traditional cheese from Cyprus and some other parts of Greece. It is more-or-less inedible raw, but really delicious when cooked properly. You will need 250 grams of Halloumi (a standard packet size from the supermarket) as a starter for four people. Heat the griddle, and wipe the surface with just a little vegetable oil. You could use a large, heavy-bottomed frying pan instead of a griddle, but make sure the non-stick surface is working well! 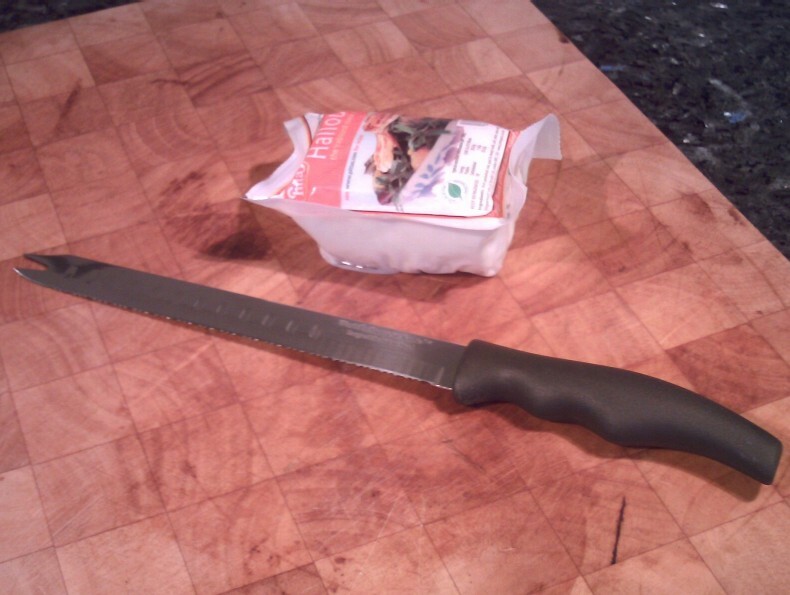 Open the packet of cheese carefully, draining off any fluid inside and put the cheese on a chopping board. 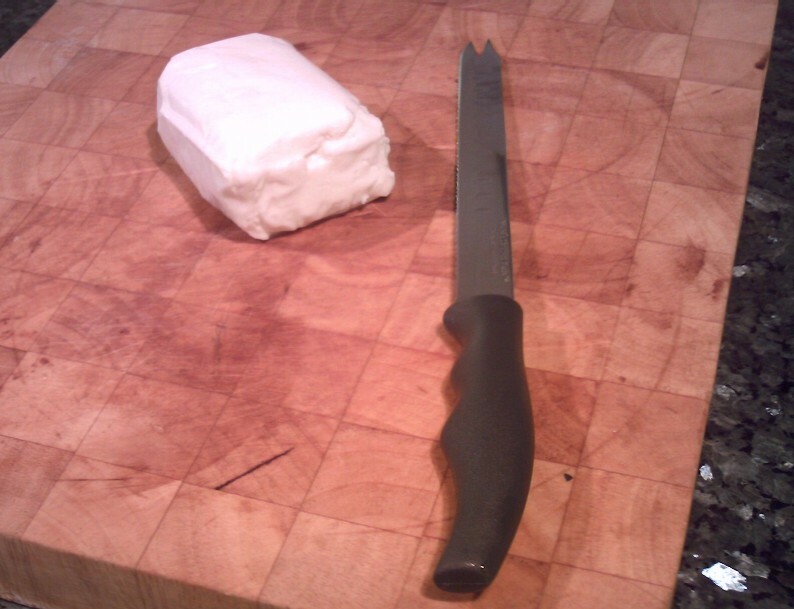 Using a sharp knife (preferrably a serrated one), cut the Halloumi cheese into slices about one-eighth of an inch (3 millimetres) thick. Be careful here! 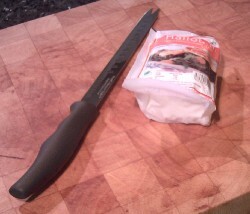 Put the sliced cheese on the griddle and cook on each side for about 3 minutes. The Halloumi should bubble and change from a rather insipid white colour to a rather nice shade of brown. While the cheese is cooking, cut eight small tomatoes into quarters. Trim and finely slice a couple of spring onions. 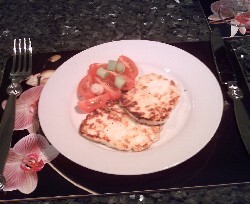 Arrange the tomato quarters and spring onions on four plates, and add the griddled slices of cheese. There should be enough cheese for two slices each (as a starter). Garnish with freshly-ground black pepper and serve with crusty fresh bread and butter.